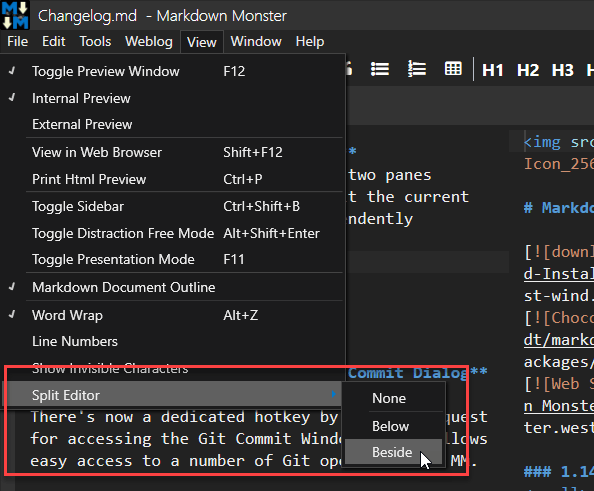 Split Editor View allows you to split the current editor tab into two equally sized panes - Below or Beside. You can edit each pane individually. Both panes have synced content, but separate scroll bars that allow you to view different sections of the same document side by side and cut and paste text between each pane. To activate this feature use View->Split->Below/Beside. To switch back to single pane view set the Split mode to None. This feature can be useful on large documents when you need to look at multiple sections of the same document at the same time, or if you need to move text from one section to another without having to excessively scroll around the document.